피자헛의 신제품 ‘갈릭마블스테이크’ 피자는 프리미엄 마블링의 안창살 스테이크를 부드럽게 숙성하여 풍성한 육즙과 입안에서 살살 녹는 듯한 육질을 살린 피자헛의 새로운 정통 프리미엄 스테이크 피자입니다. 이렇듯 지금까지의 스테이크 피자와 다른 신제품의 특징을 어필하기 위해 주재료 ‘안창살’이 최고급 마블링을 가진 소고기를 24시간 숙성 후 갈릭과 버터에 마리네이드해서 ‘부드럽다’는 점을 강조했습니다. 이에 맞춰 “이 겨울을 녹이다”라는 컨셉 하에 썰렁한 농담을 던지는 친구관계, 식어버린 부부관계 등 얼어붙은 관계와 분위기 속에서 피자헛이 등장하여 입안에서 살살 녹는 것은 물론이고 이를 통해 마음까지 녹이는 피자로 커뮤니케이션하였습니다. 특히 디지털에서는 캠페인 라이브 3일 전 모델과 관련한 부정이슈에 따라 캠페인 영상 내 모델 출연 분량을 콘티로 대체함에 따라 이와 관련한 배경정보를 전달하는 ‘피자헛 마케터 담당자의 애환’이라는 영상을 추가적으로 상영하여 수많은 영타깃으로부터 긍정적인 지지를 받을 수 있었습니다. 이는 위기 속에서도 아이디어를 내 상황을 반전시켜 재미있고 현명하게 대처를 한 마케팅 사례로 회자되고 있습니다. 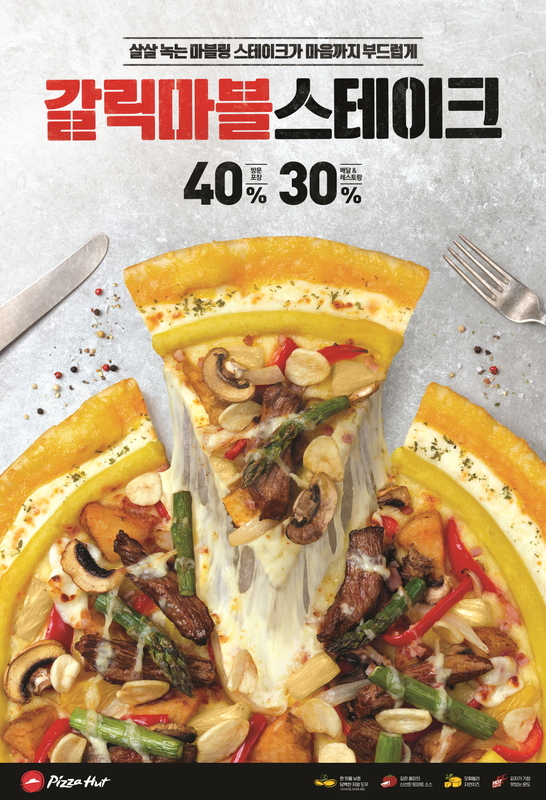 이후 모델 이슈를 추가적으로 활용하여 ‘방문포장 40%, 배달 30% 할인’을 커뮤니케이션하기 위한 ‘4030 캠페인’을 통해 소비자들이 직접 해당 프로모션에 대한 랩 컨텐츠를 제작하면 우수작을 광고로 만들어주는 이벤트를 진행하였습니다. Pizza Hut’s new product, Garlic Marble Steak, is a new autnentic premium steak pizza made with thin skirt of premium marbles with its tender texture maximized through ripening. In order to emphasize such difference of the product compared to existing steak pizzas, we emphasized the ‘tenderness’ of the steak topping, having the thin skirt ripened for 24 hours and then marinated with garlic and butter. With this, we communicated the product that will not only melt in your mouth but also melt away a cold atmosphere, with the key message, “melting away the coldness in this winter”, through the campaign message based on episodes featuring cold atmosphere and cold relationship at a college club and between couples. Especially, we additionally released a film explaning the behind story of part of the digital film replaced with continuity due to a negative issue occurred surrounding the model in the film 3 days before the scheduled release, which drove a massive positive reactions throughout the young target. The strategy was highly praised as a marketing case of reacting to a risk in a wise way. Afterwords, we further executed an event of producing commercials based on UGCs communicating “40% discount on carry-out & 30% discount on delivery”.